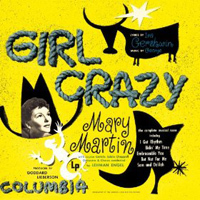 Studio Cast, 1951 (Columbia/Sony) (1 / 5) The first studio cast recording of Girl Crazy is in no way a true reflection of the show; it might have better been titled “Mary Martin and Friends Sing Songs From Girl Crazy.” There is no theatricality here, simply an assured star blandly sailing through some favorite pieces. Martin is assisted by conductor Lehman Engel plus a chorus and supporting singers who evidently have no idea that the Gershwins intended these songs to have energy and fire. Even “Treat Me Rough” sounds laid-back! This, then, is the Muzak version of Girl Crazy, and only Martin completists need give it their attention. — R.B. 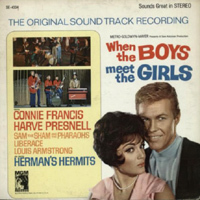 When the Boys Meet the Girls, Film Soundtrack, 1965 (MGM/no CD) No stars; not recommended. 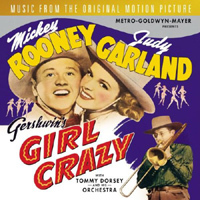 When Girl Crazy made it to the big screen for the third time, it was a humdrum effort retitled When the Boys Meet the Girls. The flick starred two enjoyable singers, Connie Francis and Harve Presnell, but neither the orchestrations nor the new material were worthy of their talents, let alone those of the brothers Gershwin. All that need be added about this soundtrack recording is that it certainly is unique: Liberace and Sam the Sham and the Pharaohs perform material that is not from the show, and where else could you find a rendition of “Bidin’ My Time” by Herman’s Hermits? — R.B. Studio Cast, 1990 (Nonesuch) (4 / 5) Six decades after its first hearing, the Girl Crazy score was finally given something close to its due. This time, there was a reconstruction of the orchestrations, and there is an almost time-capsule feel to the performances, ably conducted by John Mauceri. Although the singers work hard, the casting is not all it should be, so it’s really the orchestra and the material that make this recording special. Judy Blazer is an attractive Molly, but the Danny of David-James Carroll (he later dropped the “-James”) is too much in the sensitive juvenile vein; this show does not need a Candide! The toughest role to cast, of course, is the dramatically extraneous, musically necessary part of Kate — the Merman role. The character’s songs have “self-assurance” written allover them from the very first note of “Sam and Delilah,” and although Merman’s type of brass isn’t necessarily a requirement, some sort of magic is. Lorna Luft tries and has good moments, but something more is needed. (Maybe Bernadette Peters or Donna Murphy could make these songs work without imitating Merman.) 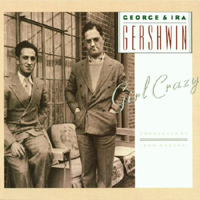 At least Mauceri and his musicians hold up their end unfailingly, and there’s a fun appendix included as well: “You’ve Got What Gets Me,” written by the Gershwins for the 1932 Girl Crazy film. This is a worthy recording that will serve well until something even better comes along. — R.B.